Things you can’t miss in Whakatane! Along the sandy coasts of the Eastern Bay of Plenty of the North Island, Whakatane is a quiet town with a lot of adventure! It would be a shame to miss out this hub where some of the best eco-experiences are combined with Maori culture. 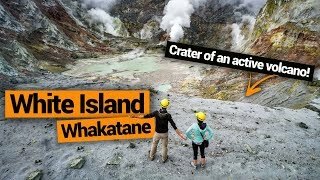 Off the shores of Whakatane are two spectacular islands: the wildlife sanctuary of Moutohora (Whale Island) and the active marine volcano of White Island. Tours by kayaking, boating and even sailing will get you to see these must-visit islands. 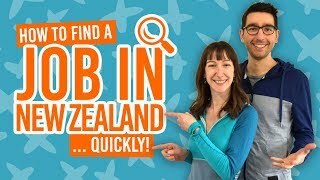 On land, there are forests filled with kiwi, rivers filled with trout, walk and bike trails to discover it all. So take a look at the list of Whakatane must-dos below, because this is a town you don’t want to miss! 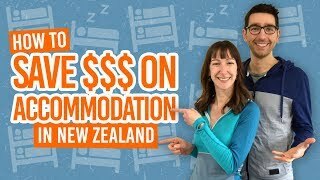 In between ticking these Whakatane activities off the bucket list, have some excellent culinary experiences from one of the Cheap Eats in Whakatane. Plus, there are more excellent activities listed on our 18 Free & Cheap Things to Do in Whakatane. 50km off the shores of Whakatane is White Islands, ever seen billowing steam into the sky. White Island (Whakaari) is New Zealand’s only active marine volcano and unlike any other landscape found in New Zealand. Be awe-struck by the vibrant colours, bubbling streams and whooshing steam. There are a few ways to experience White Island, taking a boat and walking tour from Whakatane, a scenic flight and landing on the island, scuba diving around the island, and more! Location: Activities depart from The Strand, Whakatane and Whakatane Airport. See some of the most stunning beaches, coastal headlands, historic Maori pa sites and bush in Whakatane along the Ngatapuwae o Toi Track. This 18km round trip combines several walks into one, so you can take all day to enjoy the walk or take on one of the shorter options. Head over to 10 Must-Do Walks in Whakatane for more details. Swim, surf, walk or just kick back and relax on one of New Zealand’s most loved beaches. Ohope Beach is 11km long and experiences an abundance of sunny weather and warm waters. At the eastern end of the beach, follow the walkways to the secluded Otarawairere Bay for a stunning picture opportunity. The beach here is fringed with pohutukawa trees and peppered with shells. Who would have thought that this little bit of forest between Whakatane and Ohope is home to more than 300 kiwi birds and countless other native wildlife?! While doing the walk, the Fairbrother Loop Walk, during the day is a pleasant experience, doing the walk at night is a must-do! 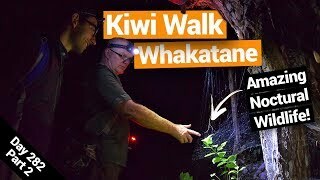 Either do a self-guided walk at night, following the interpretation panels with reflective markers which point out key wildlife habitats or do a guided walk with the Whakatane Kiwi Trust. Location: Corner of Pohutukawa Avenue and Ohope Road. Whakatane not only has some excellent cycle and mountain bike trails accessible from within the town itself, but there are some stunning backcountry cycling experiences just a short drive away! Whether you’re looking for an easy-going ride along the Whakatane River on the Whakatane River Cycleway or something more adventurous like the Motu Trails or the mountain bike trails in the Whirinaki Forest Park. There are so many epic bike trails that we simply can’t list them all here, so take a look at 6 Must-Do Bike Trails in Whakatane. Location: All over Whakatane, Opotiki and Whirinaki Forest Park. One of New Zealand’s most restricted wildlife sanctuaries, Moutohora is home endangered species like the saddleback, kakariki, little brown kiwi and tuatara. The island is accessible via boat tours, with guided walks around the island, as well as kayak and sailing tours. You’ll even get to experience the island’s hot water beach and bathe in your own personal hot pool. Location: Tours depart from The Strand in Whakatane and Ohope Beach. There are several ways to immerse yourself in the Maori culture of Whakatane. See local Maori art in Te Koputu a Te Whanga a Toi (The Whakatane Library) or visit Mataatua Wharenui, otherwise known as the “House That Came Home”. The carved meeting house has been displayed all over the world for over 100 years before being returned to its ancestral home. The meeting house is now used to host unforgettable cultural experience with cultural shows, digital shows and guided tours around the meeting house. Finally, there are Maori guided tours with NATIVConnectioNZ taking you to key cultural sites around the Whakatane area where you’ll hear local Maori legends and experience traditional Maori food in the form of a hangi. Location: Whakatane Library – Esplanade Mall Kakahoroa Drive and Mataatua Wharenui – 1 Mataatua Street. Whakatane and the Eastern Bay of Plenty region are blessed with sea waters rich in life, as well as picturesque rivers that are ideal for trout fishing! Join a local fishing guide that will take you to the best river or sea fishing spots and provide all the equipment and handle the fishing licence where necessary. Enjoy half and full day tours at any level of experience. Location: Tours available with Brian Willson Fishing Guide, His Nibs OUtdoors Fishing and White Island Day Fishing Charters. New Zealand knows how to set up an outstanding golf course. As the top participation sport in the country, New Zealand’s golf courses are world-class and the offerings in Whakatane definitely follow suit. You have the choice of the Whakatane Golf Club, with its Par 70 6009m course of fast-running greens, and Ohope International Golf Club, with spectacular views of the Ohiwa Harbour. Don’t miss these amazing golf courses, and add to the golf club bucket list with our 21 Best Golf Courses in New Zealand. Location: Whakatane Golf Club – 181 Golf Link Road, Paroa and Ohope International Golf Club – 541 Harbour Road, Ohope Beach. 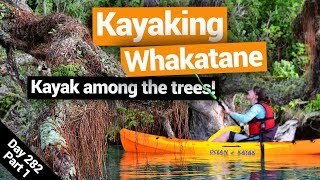 The final Whakatane must-do is a short and simple activity, but if you’re a sucker for a good photo spot then you will not want to miss this. Make your way to the sensational Puketapu Lookout. Puketapu (sacred hill) has been a lookout site for the local Maori, the Ngati Awa iwi, for more than 600 years. The site is now a reserve where you can park up and enjoy the views.